You've got experience behind you but countless new opportunities ahead. Check out these 10 ways to continue to grow your career in the years to come. If you’re in your 40s, you could be in a wide variety of places in your career. Generally, you’ve got a lot of experience behind you, but there’s still a long way to go before you can pack it in. It’s a perfect time to figure out which career goals to tackle next. 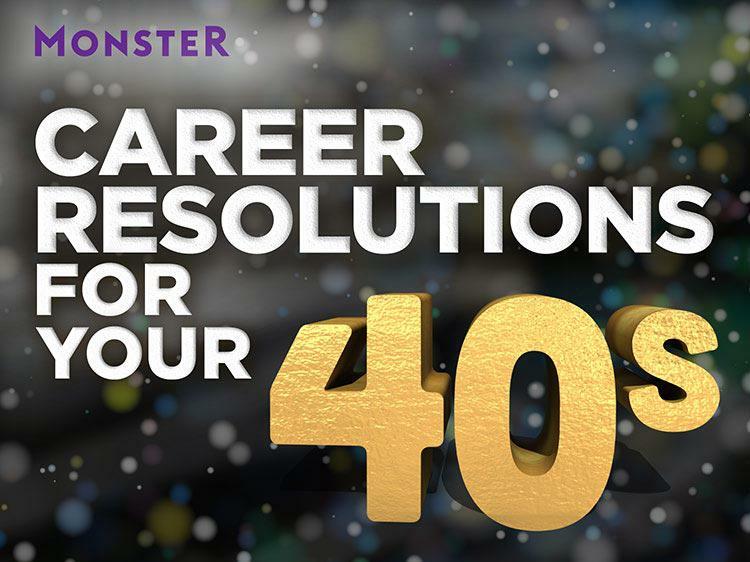 We talked to career coaches to get their takes on some of the best New Year’s career resolutions for people in their 40s. Check out what they have to say to make 2019 the best year of your career. It’s not too late to get a mentor in your 40s, Battaglia says. At this age, a mentor can help you take that next leap toward achieving your career goals, like moving into a leadership position. Find someone who is a step or two ahead of you within your company’s hierarchy, and meet this person for lunch or coffee to learn more about his or her career path. Take their advice, but mostly, forge a relationship. Even if this person doesn’t do much for your career, keep in mind that it’s also never too late to network. Laura Browne, a Glendale, Arizona-based author and business coach, recommends that people in their 40s make a sustained effort to stay on top of new technology. Start by checking out online classes to advance your career. Whether it’s becoming fluent in social media or learning about software developments in your industry, building your tech skills will help keep your other skills relevant as your career progresses. You don’t want to be that one person in a room full of 23-year-olds who doesn’t know how to use Snapchat filters. In continuing to educate yourself on social media, you’re at some point going to come across the concept of personal branding. Building your network and online presence is a good way to start learning how to build a personal brand, says career consultant Mark Anthony Dyson. Join online industry groups to increase your network and follow trends, and share insightful articles on social media. Even if it feels like strange and unfamiliar territory in terms of career goals, remember that it’s called social networking for a reason, and putting yourself out there online can be just as fruitful as hitting the next industry event. Just make sure your profile pages are suitable to be seen among your professional colleagues. You’re likely much busier in your 40s than you were in your 30s, so in the coming year work on your focusing skills. “Constant distraction erodes our ability to focus, and you may find that your attention span is a lot shorter than it used to be,” says Maura Thomas, author of Personal Productivity Secrets. “You may be realizing that being always on and hyper-connected isn’t the silver bullet you once thought it was, and you may be recognizing the benefits of presence, downtime, and mindfulness.” Meditation and enforced no-screen time can help. You never know when you might find yourself looking for a new job—either proactively or reactively, says Monique A. Honaman, CEO of ISHR Group in Suwanee, Georgia. You may think you're too important to lay off, but no one is immune—and having to start over in your 40s can be hard. Be ready for anything; identify other employers that could benefit from your skills in the event of a surprise layoff. If you do decide to make a career change, remember that doing so can take time. Starting in your 40s helps to put your remaining years on the right path, says Angela Copeland of Memphis, Tennessee-based Copeland Coaching. Evaluate whether or not you enjoy your work. If you don't enjoy what you're doing, this is the right time to make a change. It might seem scary, but don’t worry—it’s not too late. When was the last time you decided to update your resume? Why not now? It’s likely you’ve achieved a few career bullet points in the last year. “It's much easier to have all of this information ready to go when you need it as opposed to having to create a resume from scratch and remember what you have accomplished for the past 10 years," Honaman says. Take the time to add the prior year’s accomplishments, goals reached, awards, and highlights. Could you use some help with that? Get a free resume evaluation today from the experts at Monster's Resume Writing Service. You'll get detailed feedback in two business days, including a review of your resume's appearance and content, and a prediction of a recruiter's first impression. It's a quick and easy way you can position yourself for greatness in the coming months.